There are new pizza places, chinese restaurants, and burger joints popping up on every corner, all the time. There are endless decisions when it comes to these typical American favorites. But there is one taste, one style of food that is hard to find in quantity and quality. Middle Eastern food. Mediterranean cuisine is hard to come by. How often are you walking down the street and see a Mediterranean restaurant, and how often do they offer high quality, delicious food? Baba Ghannouj Buffet is different. We are the only Mediterranean buffet in the Research Triangle Park area, and we take pride in that. We serve food that screams Middles Eastern and is made with quality ingredients. Gyros, falafels, kabab platters, and so much more delicious choices occupy our menus. Additionally, you have the choice to eat off of our main menu or our buffet menu with all you can eat selections! 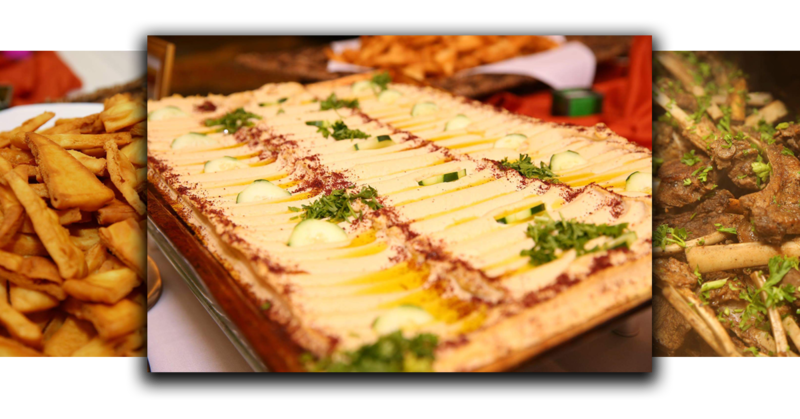 Not only are we the only Mediterranean buffet in the area, but we will host and cater your parties. So no matter what type of celebration you are having, we can provide the food, and if need be, the venue! Our catering menu differs from our regular menus, but only slightly. You can choose from catering lunchboxes, pita wraps party platter, buffet style catering, meant trays, cold and hot side tray, and dessert trays. This makes it easy for you to get all your party food need and have nothing to worry about. We will take care of you! We can also give you a place for your party. Host your event with us and enjoy our spacious restaurant, great food, and your party guests! Your worries will be lessened and your party will be a success! We want to help you make your party perfect, renting out our space to you can help you with that! If you don’t want to come to our restaurant, you don’t have a party to host, and you don’t need any catering, but you still feel a deep craving for high quality, delicious Mediterranean food, we can deliver to you! That’s right, we can bring you a delicious gyro, with beef, grilled onions and tomatoes, pickles, and tahini sauce. Or if you are feeling more like falafels, we can an entire falafel platter! The possibilities are endless and all you need to do is pick you up phone and order! There is an endless amount of great things about Baba Ghannouj. Stop by for a great Mediterranean taste, hit our buffet to stuff yourself with our delicious choices, or have us deliver to you! Check out our menus to find something you are sure to love! We look forward to serving you, hosting your party, or catering your event! Pick Baba Ghannouj when you have a craving for Middle Eastern cuisine! Bring your kid out for a dinner date on Tuesday or Thursday and they will eat free! Come in today to try out all our best dishes, ditch the traditional American favorites and go for something new, exciting and delicious!